Having a sturdy, secure carrier for traveling with your pet is vitally important. Whether you have a dog or cat, the right kennel can make life easier for both of you. But, not all pets are comfortable going into the front-entry of a pet carrier. The Petmate Two Door Top Load Pet Kennel remedies this problem by offering a top entrance, too! The best thing you can do first is to decide what it will most often be used for. 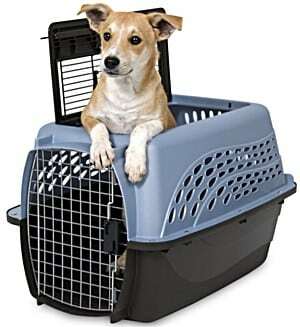 Some people want a kennel that can go with them on airplanes. Others only want them for quick trips to the vet. You may even use your kennel in the home as a safe space for your dog or cat. The Petmate Two Door Top Load Kennel can be used for a variety of needs. It’s durable, easy to carry around, and affordable! Because of the two-door entry, this kennel is a great solution for dogs, cats who may not like carriers, and other small animals who may be hesitant about going into a carrier. You should never shove or force a pet into a kennel if they’re uncomfortable. This carrier remedies that problem, making it a less stressful experience for both of you. But, what else can you expect from it? CLICK HERE to Find Out What Customers Think of the Petmate Kennel on Amazon! 1.1 Is it Safe for My Pet? 1.3 Are There Any Special Features? 1.4 Is It Suitable for All Forms of Travel? 1.6 Is the Petmate Two Door Top Load Pet Kennel a Good Choice? We’ll look at how easy it is to use and why a double point of entry is important for your pets. Safety and comfort should be the two primary components of any pet carrier. In this review, we’ll let you know what you can expect when using the Petmate carrier, as well as practical ways it can be helpful for both you and your furry friend(s). Because safety should be a key component of any pet carrier, let’s cover some of the strongest safety features of the Petmate kennel. First, it’s important to note the doors themselves. The front and side doors of the kennel are made of steel. Your pet won’t be able to scratch or damage the doors in any way, so you can feel confident that they’re secure inside. If you have a nervous cat or dog, they may try to chew or bite the small steel bars of the door, so while it’s secure, it’s not the perfect solution for everyone. Your pet may do better with a soft-sided crate. The rest of the kennel is made of a strong and durable plastic. This makes it an excellent option for travel, whether you’re taking a quick trip to the vet or traveling across the country. Your pet will stay safe and secure the entire time. One of the best safety features is built right into the design of the crate. It has plenty of ventilation throughout the entire kennel, not just due to the two steel doors. Proper ventilation is important for any type of pet carrier. Not only will it keep your pet cool and give them enough air, but it can also help to keep them calm. It gives them the opportunity to look out and see their surroundings – including you! That can help to ease their nerves, instead of putting them in a crate or carrier with no way to see what’s going on around them. This kennel is available in two colors of each size. The small measures (19.25″ x 12.8″ x 10″) on the outside, and (16.5″ x 10.5″ x 9″) on the inside. Metallic Pearl White and Coffee Ground Bottom. Pearl Honey Rose and Coffee Ground Bottom. This would be the best size for a kitten or small cat, puppy, or smaller pet. The suggested limit is under 8 lbs. The large measures (24.1″ x 16.7″ x 14.5″) on the outside, and (21″ x 14.75″ x 13.25″) on the inside. Metallic Pearl Ash Blue and Coffee Ground Bottom. Metallic Pearl Tan and Coffee Grounds Bottom. This size is a good fit for cats and puppies or dogs that weigh between 10 and 20 lbs. If you’re not sure which size to get your pet, the best thing you can do is measure them. For cats and dogs, measure their length from the tip of their nose to the tip of their tail. For height, you should measure from their feet to their ears. Then, you want to make sure they have a few inches of extra space. Measuring the height and width of your pet will give you a much more accurate idea of which kennel you need, instead of basing it on weight. CLICK HERE to Purchase the Petmate Two Door Top Load Pet Kennel on Amazon! Once you know that a kennel is safe and can accommodate your pet, its the extra features that set them apart. Sometimes these can be extra benefits for safety. Other times, they might benefit you as the pet owner, or be a bonus for your dog or cat. There are a few extra features you can look forward to when choosing this carrier. For example, the small carrier includes a water cup. 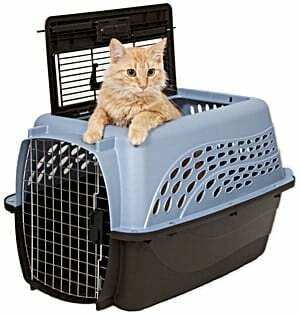 That can be a big help if you’re using the carrier as more of a kennel. If your pet is staying in the carrier for long periods of time, a small water dish can keep them cool, hydrated, and relaxed. Unfortunately, the water cup isn’t included in the larger kennel. But, you should have enough room to add your own dish. One benefit for you is the ergonomic handle. This is a hard, durable crate. Even carrying a small animal inside can start to get difficult easily without a comfortable handle. With the ergonomic handle, you’ll be able to have a strong grip, but your hand won’t get sore or tired quickly. Is It Suitable for All Forms of Travel? Because of the strong durability of this kennel, it can be put to the test. It meets airline approval standards, so you can take your pet with you even if you’re going on a long trip. You won’t have to worry about the crate getting punctured or damaged like you would with a soft-sided crate. The great thing about using this carrier for any kind of traveling is that it can double as a kennel/home for your pet while you’re somewhere new. If you’re staying in a hotel, RV, etc., your pet will still have a comfortable and familiar place to go. That can make traveling much easier for everyone. This Petmate kennel is a great hard-top option for pet owners. But, there are some things to consider before you make your final decision on whether it’s the right carrier for you. Let’s look at some of the most notable pros and cons. Two-door entry for nervous animals. Hard plastic exterior for extra durability. Strong steel doors that close securely. Great for all types of travel. Comes in different sizes and colors. Features an ergonomic handle for extra comfort. Heavier than some other carriers, especially soft-sided ones. The top door does not remain open on its own, so you’ll have to hold it while lowering your pet inside. No water bowl is provided for free with the larger-sized model. As you can see, the positives outweigh the negatives. The heaviness of the kennel speaks to its durability because of the strong, thick plastic. But, that can become hard to carry after a while. That’s something important to consider depending on the kind of traveling you’ll be doing. Is the Petmate Two Door Top Load Pet Kennel a Good Choice? This kennel is a popular seller for a reason. It’s durable, easy to hold and carry, and will keep your pet safe. 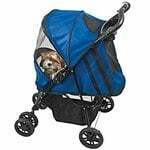 It’s great for all different types of traveling and can even work as a makeshift ‘home’ for your pet while you’re on the road. Plus, the top-loading option can be a massive help if you have a nervous animal who shouldn’t be forced in through a front door. Not only will it keep your pet safe and secure, but you’ll be able to take them with you comfortably no matter where you need to go. Choosing the right pet carrier or kennel has a lot to do with your needs. A hard, plastic carrier is excellent for some people, while others may prefer something softer and collapsible. You know your pet’s personality better than anyone. The best feature of this crate is that it has two entry points. But, it also offers so much more. Take your pet’s personality and your travel needs into consideration when choosing a carrier. If you need something that is durable and comfortable for your pet, this is a great option! Before your next trip or vet visit, visit Amazon to purchase the Petmate Two Door Top Load Pet Kennel – Amazon’s popular product for cat and small dog hard-sided carriers!